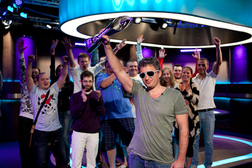 Russian Leonid Bilokur took down the $25,000 High Roller early Sunday morning at the PokerStars Caribbean Adventure. He outlasted a field of 148, including an elite final table, to pocket about $1.1 million. 2010 World Series of Poker champion Jonathan Duhamel entered heads-up play with a substantial chip lead, but finished second. The score was yet another final table for him in the Bahamas. Duhamel was the victim of an attack and robbery in his home late in 2011, but he’s started off 2012 with some run-good. He also took fourth in the $100,000 Super High Roller, fifth in a $5,000 side event and first in the $5,000 eight-max event. He’s now won more than $1 million this calendar year — and it’s only been two weeks into January. The Canadian now has nearly $11 million in career cashes and sits near the top of the Player of the Year race (sponsored by Lock Poker). Both Bilokur and Duhamel had to overcome Jason “NovaSky” Koon, who entered the final table as the chip leader, but fizzled in fourth. Other notables at the end included Isaac Haxton, Nicolas “PKaiser” Fierro, Mike “CuteIsWhatIAim4” Telker, Randy “nanonoko” Lew and Govert Metaal, who final tabled the event last year. Both Haxton and Lew were coming off a big tournament score in the past few months.